(CNN) -- "He knows if you've been bad or good..." doesn't hold quite as much weight when Jolly Old Saint Nicholas is vomiting on a Manhattan sidewalk into his gift bag. This is the ghost of SantaCons past, an annual event when thousands of revelers decked out in Santa costumes take to the bars of New York to get into the spirit -- and spirits -- of the season. In recent years, city residents have publicly complained that the bad Santas far outweigh the good, citing highly publicized instances of extreme intoxication, lewdness and vandalism. 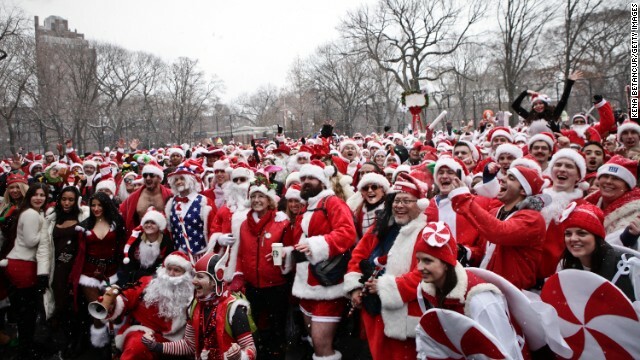 Revelers dressed as Santa Claus pose for a picture at Tompkins Square Park during the annual NYC SantaCon on Saturday, December 14, 2013. Revelers run as they arrive at Tompkins Square Park in New York. Clauses line up outside a bar in the East Village. A poster banning SantaCon participants is displayed outside a restaurant in the Lower East Side. 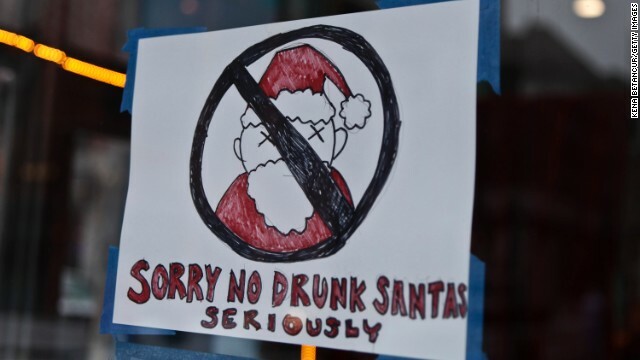 Some community groups have established a "Santa-Free" zone that urges bars not to serve alcoholic beverages to people participating in order to dissuade incidents of public vomiting and urination in the streets. A couple dressed as Santa and Mrs. Claus cross the street in Manhattan. A couple participating in SantaCon pause for a kiss on a subway platform. 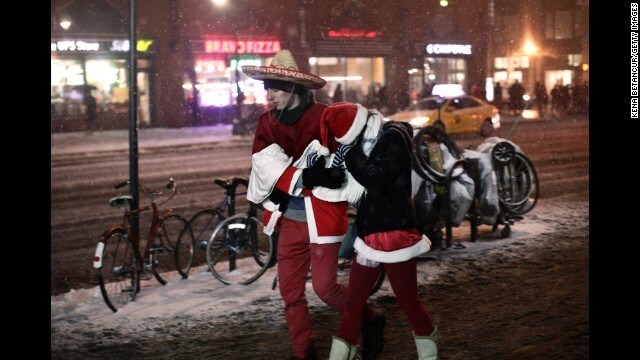 Snow falls on a couple of chilly Santas as they make their way through Manhattan. Snow-dusted Santas wait outside a filled bar on the Lower East Side. In preparation for the now-infamous event, Metro-North and Long Island railroads issued a temporary ban on alcoholic beverages on their trains, while community boards in the Lower East Side and East Village neighborhoods of Manhattan and the Bushwick neighborhood of Brooklyn said they will not allow the bar crawl to take place in their areas. "Some of the stories that I've heard about that certain neighborhoods don't want them in their neighborhood, these are public streets. 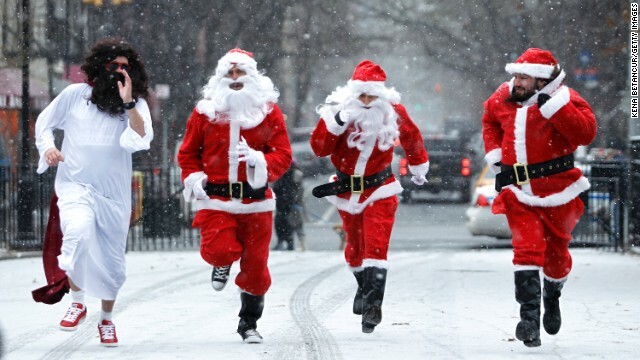 Neighborhoods can't say to people you can't come on our public streets," Norman Siegel, an attorney for SantaCon, told CNN affiliate WABC. In an attempt to get back on the public's nice list, SantaCon organizers hired Siegel, a civil rights attorney, to help the group with street permits and to revitalize their image. They say they do more good than harm, raising money for charities like Toy for Tots and the Food Bank of New York City. "Even if you disagree with the content of the message of the group, they have the right to express that viewpoint," Siegel said. 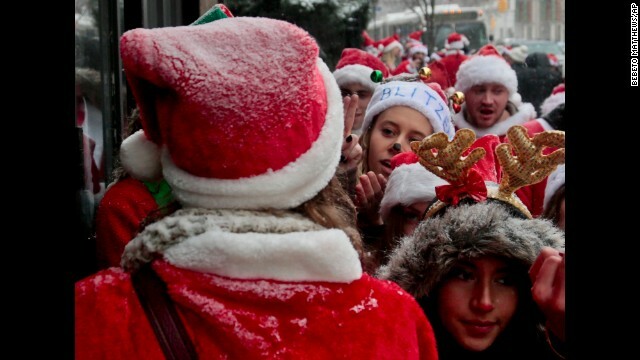 With "compassion" for the current civil rights protests going on around the country and public objection to SantaCon, the organizers have vowed to rein in the debauchery. 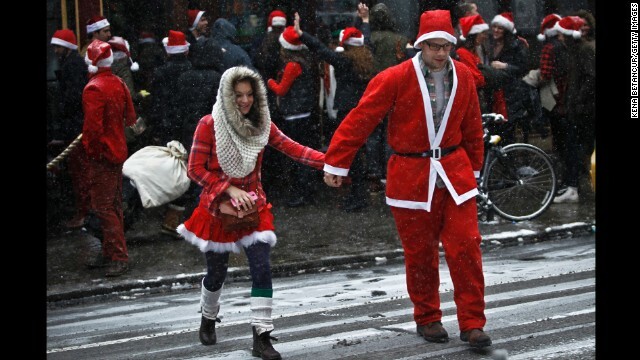 On the SantaCon website, they encourage participants to moderate their drinking and behavior, and suggest they spend most of their time inside the venues versus out on the streets. "...It's more important this year than ever to pace yourself, watch out for your elves and stay safe. 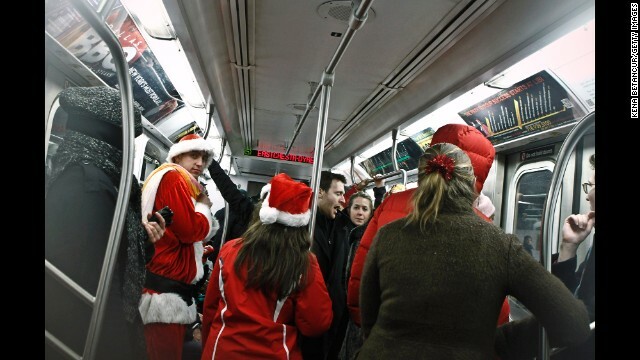 Fighting, public urination and vandalism are unacceptable and a great way to ensure that there will be no SantaCon in 2015. 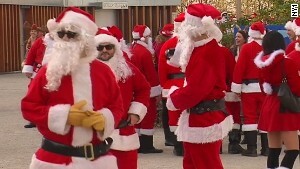 #dontscroogesantacon," the organizers said in a press release earlier this month. The event is scheduled to take place on Saturday. 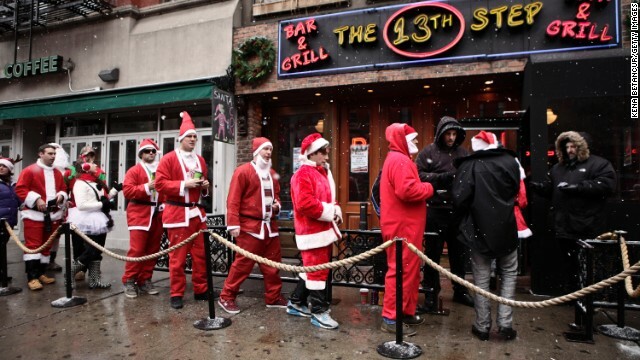 The participating bars were announced on Friday through SantaCon's app, and are located mainly in the Murray Hill and Hell's Kitchen neighborhoods of Manhattan. "If a venue isn't on this list, it's because they don't want you there," the organizers emphasized.